Peter Taggart was championing high-performance homes long before it was hip. Today he’s a leader in Maine’s green building movement. Long before disruptor became a buzzword and businesses began singing the praises of “out of the box” thinking, Peter Taggart was, to use another cliché, marching to the beat of his own drum. For over 28 years, he has been at the forefront of the green building movement, promoting sustainable building materials, passive heating, and conscientious restoration. In 2006 he built the first LEED-certified house in the country in Freeport, with high-performance windows, Forest Stewardship Council-certified framing lumber, and radiant-heat flooring, as well as passive solar heating. These days, Taggart has less time for manual labor. 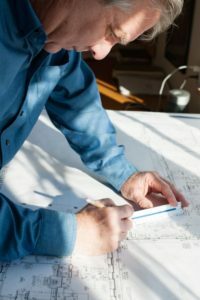 He manages a team of 26 employees and an extensive project file that includes restoration jobs, custom millwork, and eco- friendly construction. Over the years, his interest in motors and fuel morphed into a fascination with green building and sustainable energy sources. As his skills in the mechanical field grew, so did his awareness of fossil fuels and their limitations. Today two gleaming white electric cars, charged up and ready to head out to a job, sit outside Taggart’s downtown Freeport office. When I step inside, he motions to the floor: “You can take your shoes off to feel it, if you want,” he says. Although it appears to be a normal hardwood floor, below a thin layer of bamboo lies concrete, which is heated by a system of tubes and gives off a gentle, radiant heat. I keep my shoes on, but I bend down to feel the warmth that seeps up from the floor. It feels heavenly. Taggart engages in this kind of mental analysis every day. He is constantly trying to find new ways to reduce energy usage, find safe building materials, and build healthier, more efficient homes for his clients. His workplace functions in part as a testing ground for new technology. There is a heat pump in the lobby, which takes in outside air, extracts heat, and blows it into the room. Upstairs, the offices are decorated with furniture and cabinetry made from various types of fast-growing or repurposed materials, such as sorghum plant stems and sunflower seed shells. And of course, there are solar panels on the roof of the building, which Taggart and his team use to charge their electric cars. “We have a meter so we know exactly how much power we use. We can even plug tools into the truck and run them off that energy, so we can work on a job site with solar power,” he says. As an added bonus, employees never need to take their own vehicles to jobs. But Taggart isn’t satisfied with greening his own spaces. He is also an active member in the design- build community, where he promotes energy-efficient practices and helps spread awareness about options available to eco-minded builders. In the late 1990s, he was a founding member of Builders and Architects for Sustainable Environments, a group that met once a month to discuss green building topics. In recent years, he has worked with the Northeast Sustainable Energy Association, donating his time and knowledge to help “sustain the sustainers” by teaching profitable business practices to environmentally conscious business owners.